In Macau, the Canidrome racetrack is losing the debate over greyhound racing. 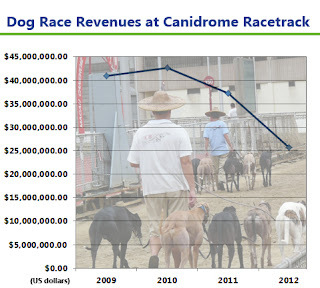 According to new statistics from the Macau Gaming Inspection and Coordinator Bureau (DICJ), in 2012 dog race revenues at the Canidrome declined by a staggering 31%. This revenue drop shows that public opinion is turning against the track, and it is starting to pay a heavy price for its stubbornness. Over the past year, GREY2K USA has fought for changes in Macau, working with Animals Asia, Animals Australia and ANIMA. The Canidrome has no adoption program, and every greyhound that competes at the facility is eventually killed. More recently, we have reached out to the global animal welfare community to ask for its help, and the response has been overwhelming. Today, there is a global chorus of voices speaking up for the Macau greyhounds. So far, the Canidrome's owners have tried to simply ignore this wave of criticism. They have pretended as if nothing has happened, and are continuing to kill dogs. This callousness goes against our global humane values, and as a result the track is now in great danger of a total loss. The Canidrome's land lease expires in 2015, and it is quickly running out of second chances. The Canidrome's owners must now make a choice: they can stop killing greyhounds or be prepared to face future losses and eventually see the track close. Either way, change is on the way for the greyhounds in Macau.